I was scrolling through Quora when I stumbled upon the question: Has a person ever said something to you that made you rethink your life? It reminded me of a little incident. “I don’t know, wherever life takes me,” I responded. His words stuck to my mind. Life is just like a flowing river. At times there are ups and downs, at other times it is monotonous. Along its journey the river picks up everything that falls into it. Some are significant enough to excite or interrupt its flow, others don’t cause much of an impact. Many of them flow along; some go only a short distance before sinking, some go a long way, possibly all the way, and others disappear instantly. But the river never stops flowing, carrying along all that can keep up with its flow. While blocking or going against this flow can be devastating, going along can take one to exciting new places. Let the river flow. You don’t know where you might end up, but that’s what makes the journey interesting. I felt like translating this famous song/poem of Kazi Nazrul Islam today. I’m not entirely sure about the original title, it is probably the first verse below. It is interesting how he compares the character of God with the innocence and naivety of a child. In solitude, Lord, in solitude. Lying about Your Florid Feet in abundance. Untouched by joy or grief. This is my attempt at a translation of this essay by Rabindranath Tagore on the recent occasion of his death anniversary. There are many differences between Friendship and Love, but they are not easy to catch. Friendship is ordinary, Love is ostentatious. A few patches here and there are perfectly acceptable on Friendship’s ordinary outfit; it may be ragged and may not even reach below the knee. It works as long as it is comfortable. Love’s attire, however, ought to not have a single patch or stain; it has to be prim and proper. Friendship endures being pulled, pushed and dragged, but Love does not. It pains us to see the subject of our love indulge in lowly activities, but this is not true in the case of our friend; in fact, when we have delved into luxury and pleasure we want our friend to join in with us! We wish for our subject of love to be our ideal of beauty—whilst we insist that our friend be an imperfect worldly being just like us. Friendship is in our right hand and in our left hand. We want affection, sympathy and help from our friend, which is why we want our friend. But in the case of Love we first and foremost want the subject, and because we want to own them in their entirety we demand their affection, sympathy and company. Even if we get nothing we still love them. In Love it is them we want, in Friendship it is a small part of them we want. Friendship consists of three things: two people and one world. That is, two people assisting one another in the world. Love consists of two people only and no world. The two are each other’s world. So two and three in the case of Friendship, one and two in Love. Many say that Friendship can gradually evolve into Love, but Love can never devolve down to Friendship. Once one has been loved, they will either be loved or not be loved; but once Friendship happens nothing keeps it from gradually evolving into a relation of Love. That is to say Friendship has space to move up and down, because it does not take up all the space. But Love leaves no space to move up or down; when it is there it occupies the entire space, or it is just not there. When it finds its occupancy shrinking it refuses to remain in the smaller space that is of Friendship. A king may be willing to be poor, but how can the fief lord live as the fief guard? For him it is either kingship or poverty, there is nothing in between. Then there is another saying—Love is a temple and Friendship is a dwelling. When a god abandons his temple it can no longer be used as a dwelling, but a god can always be placed in a dwelling. Let me end with a quote of Leo Tolstoy which fits nicely within the context. 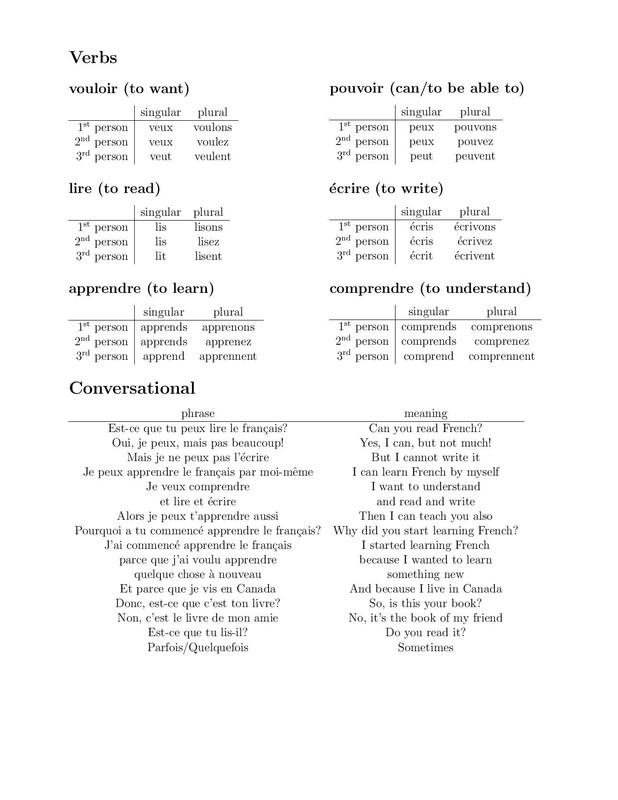 Here is some French I learned recently that I want to keep on practising. I am fairly good with les nombres, les jours de la semaine, et les mois hence did not include them.